Home › Forums › Mark R.
4 years, 4 months ago	 Mark R.
URGENT: "Error #36. Transaction failed…"
This reply was modified 4 years, 3 months ago by Mark R..
Here’s a conversion between a BeyondPod developer and a devoted/talented member – it sheds some good light on what is going on behind the scenes. Yes – indeed it will work from within an Android browser – just not any Android App (like DoggCatcher). The one exception is that BeyondPod was able to figure out a workaround. However, going to each and every podcast software developer and get them to add the same workaround is not a good solution. We can’t just exclude Android users. And we can’t be the only one using HTTP Auth and have Android users. Have you run into this before? Has anyone got S2M + S3 CloudFront to work with Android users? It does – and you’re right… PayPal’s naming scheme is horrible. I still don’t know for sure which one is actually working – but the fact remains it does work. So I’m not going to touch anything. :) Thanks again for your help! As you predicted – PayPal did have something messed up on their side. They corrected it, and at the same time, I did remove the settings that the above video said to set. It does appear to work (no errors on the client side), but then again – I don’t see the charge on the PayPal side either. It doesn’t help anyone that PayPal keeps changing their nomenclature and product names. The S2M demo video doesn’t seem to apply at all anymore and should probably either be taken down or updated). We’ll keep testing – thanks for your continued help! It seems from your recommendations above that in s2M we should only use PayPal Pro or PayPal PayFlow–but not both. Thank you for the support and responses. We’re actively working with you and PayPal (at a DefCon 5 level) because we’re loosing members and the goodwill we’ve worked so hard to earn and keep with our membership. From the above suggestions. “…removing all of your Payflow configuration options from the s2Member Dashboard panel, in hopes that your current PayPal Pro account will work without it,” and “…regardless of which API s2Member is working with, Recurring Billing service must be enabled,” it sounds like we should chose only one option in s2M. It seems we should chose either PayPal Pro, or PayFlow–but not both. Is this true? If we gave 2sM admin access to our PayPal account, then s2M would be the one party with full access to all three sides of this issue (Our WP, S2M, and PayPal). If s2M could work in a “PayPal partnership” arrangement then s2M would be able to offer a higher level service agreement to its customers–and with a backstage pass to PayPal, s2M would be able to see all the settings and line them up so everything would work–every time. This full access could enable s2M to further develop the s2M app so the app could use our PayPal credentials, log into PayPal on the app side, and coordinate s2M and PayPal settings. Then s2M would become a “one click” app by us and all other s2M/PayPal users. That one seems fairly obvious–but at the same time I fully understand implementing it would not be easy. An app that could do that would/could/should eliminate the payment problems we’re experiencing now. And if that app gave s2M customers a high level service agreement option, the app could be called the s2Member Edge because it would give s2M a huge edge over all other competitors with WordPress:PayPal transaction management. Here are the results from the last test (all PASSed]. We’ll send the log files as well. 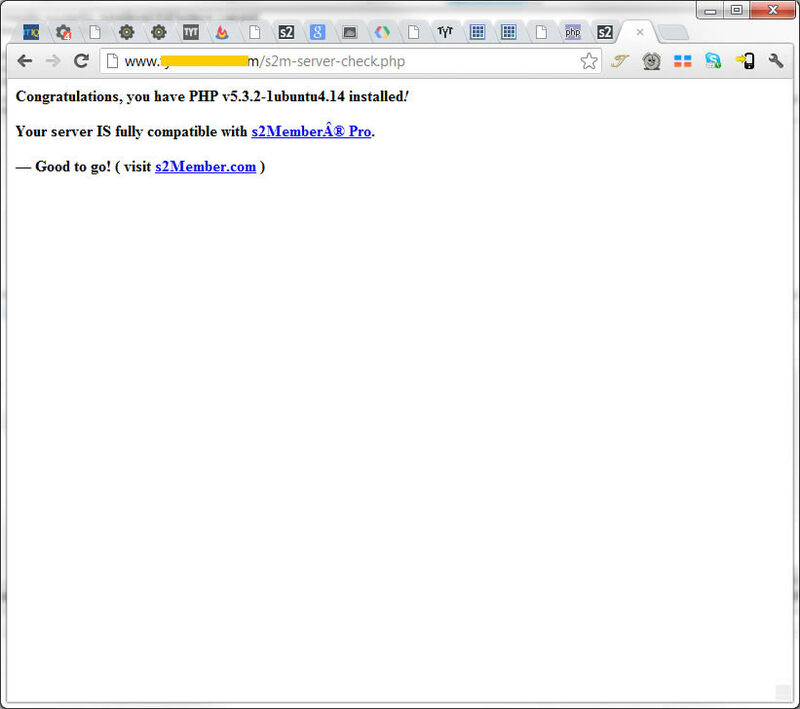 Congratulations, you have PHP v5.3.2-1ubuntu4.14 installed! Your server IS fully compatible with s2MemberÂ® Pro. You said it was several pages… but that’s all that it displayed. This reply was modified 4 years, 4 months ago by Mark R.. I went through three log files. The data is sensitive so I can’t post all of the content here. Referral: 10422-The customer must return to PayPal to select new funding sources. I didn’t see a common thread with the 145 successful transactions. \’payer_email\’ => \’syntaxterror7@gmail.com\’, < <<<<<<<[Chris]< This may also be a problem with one of the failed 62 transactions. So if we’ve got “…an invalid configuration of s2Member, or a problem with server compatibility,” it’s inconsistent with about a 40% failure rate. Thank you for enlightening me about server side object caching. Yes, we were testing caching plugins when our site was slow–we didn’t know that the host was throttling our site. The site was just crawling on the front end and on the back in. Typical page loads front and back were running 40 seconds! So I got the GTMetrix plugin, and also ran the site URL through every site analysis tool I could find on the internet. I aggregated their advice and took care of the highest priority items first–one of the biggies was caching. So we ran through a fist full of caching plugins, one at a time and then some together, because they addressed different issues. So we probably caused the object caching during this phase of our crisis. The sad thing is that our site was a bit heavy but not horribly bad, normally loading in 8 seconds. But several of us lost a lot of time and we lost some member goodwill, trust and interest because Bluehost throttled our CPU down. We didn’t know this so all our work was essentially useless. We’re in much better hands now with WPEngine. They manage caching for our WordPress site–so it’s like lightening now. First, the behavior stopped. And yes, it should never have happened. IT was a registered user’s info and data. And of course it’s not a feature we want. To clarify the behavior, our membership site has s2Member Pro and a few thousand members. Randomly, the Upgrade Membership page (a WordPress page with the Upgrade Membership shortcode), began displaying one member’s information. We visited the page from different computers, different geographic regions (UE and EU), and with five different browsers (Chrome, MSIE, Safari, Firefox and Opera). At the time I posted the original message, all of us from our different computers, browsers and parts of the world, could see this same user’s info in the Upgrade Membership page. We were all Admins and the user was a free subscriber. So if it was a caching issue–how did the member’s info appear in a page for all of use? And if WP was caching the info–how did it get into the s2M shortcode fields in that page? We have since ran into other issues with the hosting company so we relocated to a more robust host. And this issue is no longer an issue–but it would be real good to understand how all the world could go to our Upgrade Membership page and read private info about a registered member. BTW We left the host because when our site got heavy traffic they throttled the CPU and choked our site during the time when we needed bandwidth and CPU the most. I won’t mention their names but their initials are Bluehost and Bluehost CPU throttling killed our site. Bluehost could have made money by charging us to upgrade our CPU rather than automatically choking it–but they’re not a problem for us any longer. So this issue is gone–but we wonder how it happened and why WP and the s2M shortcode was displaying the private member data. That’s a very undesirable behavior. Thank you Cristián, I’ll read the article and see if we can find out how to work around the mod rewrites. We don’t know where the mod rewrites come in–if it is s2M (we looked into the Remote Auth settings under File Download Options). We don’t know what app is creating the mod rewrites, but we need to work without them. You are right. We suspected that this would only happen with logged in users. We’ll look into it and see what we need to change from your suggestions. Our site is protected by s2Member Pro. Our feeds begin as posts and podcasts with multimedia files protected by s2Member (L2 and L3). PowerPress adds the posts to our feed. When anyone uses a feed reader or iTunes to view the feed it requires the s2M L2 or L3 authentication to view the podcasts. In browsers, unauthenticated feed readers are redirected to our Membership options page when they click a link in the feed. Two with one stone – nice job. That does make sense. I did both – changed to non-safe mode, as well as upgrade. At least it’s a DIFFERENT error – perhaps this one is easier to troubleshoot. Well that was easy – it was obviously a conflict since those CF settings we already manually set up. Once I deleted those, it created them again perfectly with the correct settings. WONDERFUL. This reply was modified 4 years, 10 months ago by Mark R..
Great (at least from a troubleshooting standpoint). I’ll set up the FTP account and submit now. Bendix – we’re in the States, so I’m not sure what is going on. Perhaps when we get to the bottom of it we can help you as well. Nope. new install – new database. Same exact issue. I added the S3 bucket no problem – but the CloudFront fails with the same exact error on a new install/new database. Now what? Also, we’re running the most recent version as this is a brand new install (and we’ve never used the system before). I’ll supply the admin U/N P/W on the form. I can try it again, this time with a new database. The link works just fine (it references http://www.thenewtyt.com/?s2member_file_download=/video.mp4 – which does download). However, the jw-container DIV tag is of course no where references (there is no CSS file that it references). Where is that suppose to come since we manually installed the JW player per your instructions? When I did finally get the video window to display, when you click START it errors saying the video cannot be found. I absolutely have watched the videos (great to have) – and followed it exactly. And I get that error – just as others have. On a side note, one thing that it doesn’t mention is that if you haven’t entered in default download limits the video will not be displayed. I figured that one out after a bit, and at least now shows the window. But when you click play, it can’t find the video the download link works – but it’s using the S3 link rather than the CloudFront one. The steps are rather simple: copy and paste the S3 settings, copy and paste the CloudFront settings, click the checkbox to auto-configure. That’s it. When that fails, it leaves us with a very frustrating “what next” feeling. I’ve read many threads that tries to deal with this 400 error – and tried everything I can think of. I’ve triple checked the keys – copied directly without additional spaces. I still get this error. Any additional help would be greatly appreciated as we can not use S2 without this working.